Hannah Genders visits an urban food-growing project in Bristol. I’ve been offered an exciting role at the RHS Malvern Spring Festival this year – it is as an ambassador for the show, with responsibility for promoting edibles. This role has given me the chance to invite all sorts of projects from around the UK who are involved in growing food and changing people’s lives and enhancing communities in one way or another. I’m loving the experience and this week I’ve been down to Bristol because one of the projects coming to the show is “Incredible Edibles Bristol”. 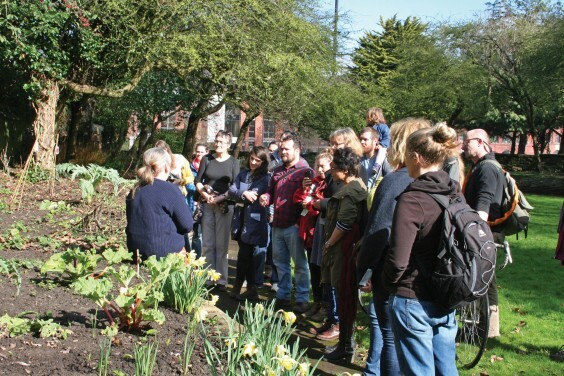 The Incredible Edibles movement was set up in 2007 in Todmorden, West Yorkshire, and it is an urban food-growing movement that seeks to use any spare space in our towns and cities for growing local produce. The work brings communities together, helps educate by teaching individuals how to grow food, and encourages businesses to grow food on their land. The Bristol version of Incredible Edibles is relatively new and was only set up in January 2014, but under the leadership of Sara Venn it is growing fast. They now have more than 100 sites across the city, and it was for the relaunch of their Urban Food Trail (above) that I visited and walked around with Sara to see the plots. The plots range from a single raised bed outside Temple Meads train station to a small park in a city centre location that needed several weeks of clearing overgrown shrubs and brambles before there was any space to plant. Sara, by her own admission, is a person who finds it difficult to say “no” – so the rate at which the project has grown is quite amazing and inspiring. The produce is free for anyone to help themselves and this offer of free food often gets people along to help with the planting and weeding, learning valuable skills in growing food. As all the sites are very urban, watering is often an issue and Sara and the team have had to learn what can grow in arid conditions. They are also testing a bed system that holds a reservoir of water underneath to self-water some of the raised beds. If this just seems like a nice idea, it’s worth noting what has happened in Detroit. The city of Detroit in America was one of the leading cities for car production in the world and in the 1950s it had 1.8 million residents – then disaster struck; the bottom fell out of the car industry and the city went bankrupt. Most people moved out and the population of the city today stands at 900,000, leaving around 33,000 empty houses and buildings. Many of them are burnt out and vandalised but what remains are the gardens and spaces around the industrial buildings. A movement started there in 2008, when a few people got together and started cleaning up their environment. They took over empty plots and planted orchards, vegetable gardens and flowers. They offered food for free to anyone who needed it, just like the movement here in the UK. Something remarkable happened – out of this small community-led idea a whole city-wide initiative has grown up, and Detroit is now recognised as one of the lead cities in the world for local urban food production, growing the majority of its fruit and vegetables within the city boundary. The small beginnings of these charity-run urban gardens has since grown into big business, with the mayor of Detroit recently giving more than 40 acres of city-owned land to food production, creating jobs and continuing to supply the city’s restaurants and businesses with produce. The food-growing extends to bee-keeping as well, ensuring good fertilisation for the crops, and some of the disused warehouses are being set up as hydroponic systems for growing tomatoes and salad crops on a commercial scale. The city has literally turned from car production to food production in less than ten years. It seems to me that at a time when we are all concerned with buying local, reducing food miles and engaging more with our community, the simple idea of growing some edibles in a space that is otherwise unused is an idea worth sharing and getting behind. There will be opportunity to meet all the food-growing projects at the Malvern show, ask questions and hear the project leaders being interviewed.